Sukanya Verma takes a look. IMAGE: It may be Nadira and Asha flirting with us in Mud Mud Ke Na Dekh, but we are the ones who can't stop watching... or singing along. IMAGE: No one can resist Madhubala's come-hither invitation in the Aaiye Meherban song from Howrah Bridge. IMAGE: Asha's masti makes you smile in Teesri's Manzil's Aaja Aaja Main Hoon Pyaar Tera. 17. 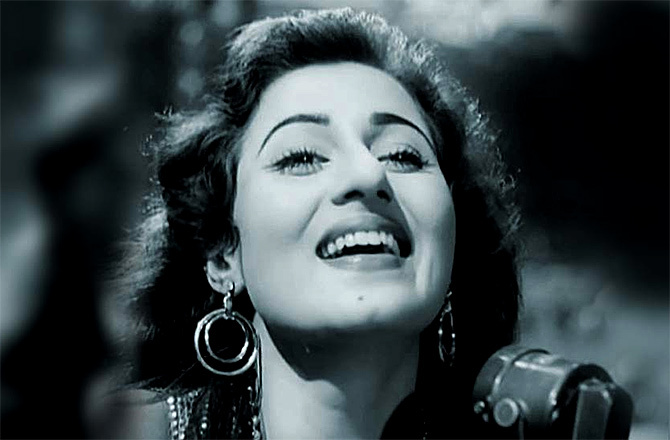 Nigahein Milane Ko Jee Chahta Hai, Dil Hi Toh Hai (1963): 'Woh Tohmat Jisse Ishq Kehti Hai Duniya, Woh Tohmat Uthane Ko Jee Chahta Hai...' Her golden voice radiates so much conviction; it doubles the credibility of an already fantastic track. 18. Ab Ke Baras Bhejo, Bandini (1963): The crumbling hope in her voice, while resonating Shailendra's heart-breaking lines against S D Burman's sombre tune, is a far cry from the joie de vivre she's known for. 19. Kahe Tarsaye Jiyara, Chitralekha (1964): Teaming up with sister Usha Mangeshkar, the duo ooze classical fervour in the absolutely electrifying Kahe Tarsaye. 20. 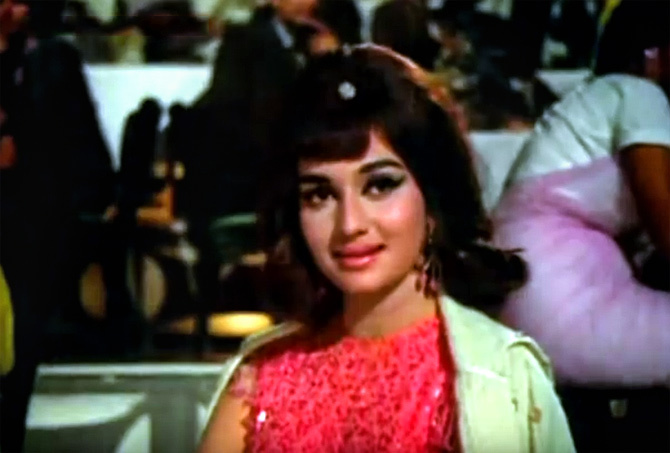 Ishaaron Ishaaron Mein, Kashmir Ki Kali (1964): The 1960s heroine typically alternated between coy and flirtatious. 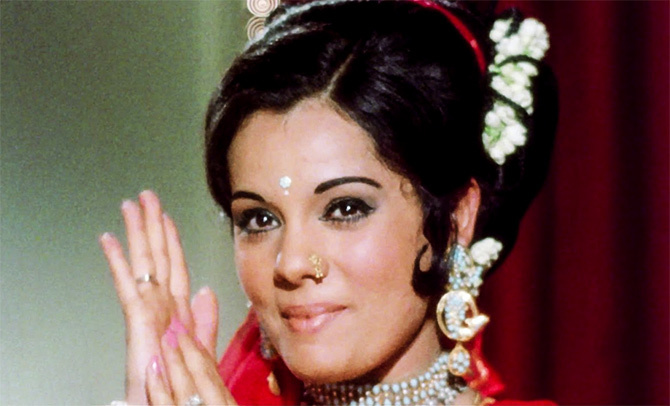 Asha embodies the demure darling for Sharmila Tagore's debut in Kashmir Ki Kali. 21. 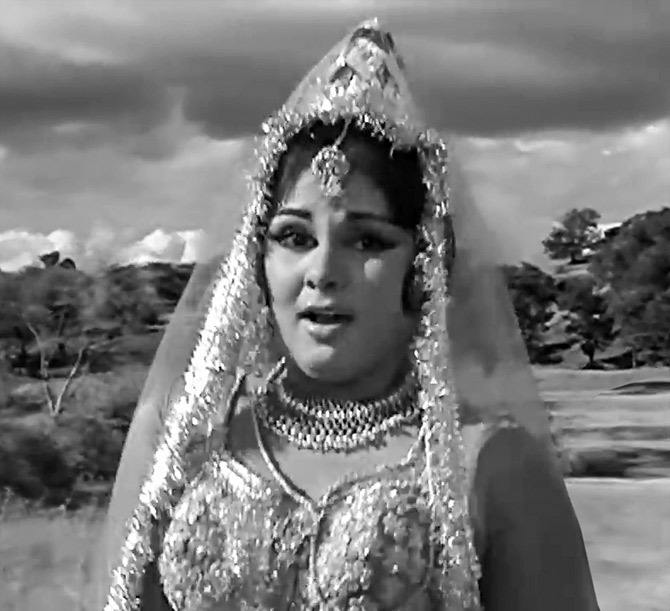 Yeh Reshmi Zulfon Ka Andhera, Mere Sanam (1965): And promptly transforms into a daring damsel for Mumtaz in the sublime, seductive Yeh Reshmi Zulfon. I like it better than O P Nayyar's similar-sounding ditties, Aao Huzoor Tumko (Kismat) or Woh Haseen Dard (Humsaaya). 22. Aage Bhi Jaane Na Tu, Waqt (1965): Asha spews carpe diem-ish philosophy like only she can in Yash Chopra's glossy family drama. 24. Aaja Aaja, Teesri Manzil (1966): It's no fun picking just one from an album as eclectic as this. But the singer simply outshines Rafi in this zany, madcap Rahul Dev Burman rock 'n' roll number with her incredible ah-ah-ah-ah someness. IMAGE: Asha lends support to Tanuja's innocent seductress in Jewel Thief's Raat Akeli Hai. 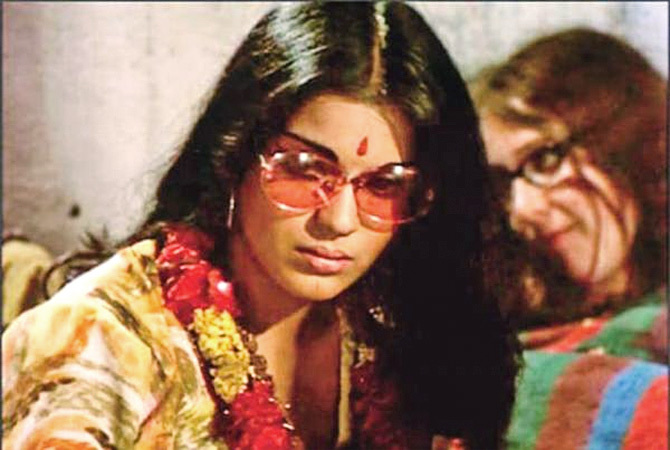 IMAGE: The magic of Asha-Zeenat in Dum Maaro Dum... We really needn't have identified that for you, did we? IMAGE: Mumtaz personifies the romance in Asha's voice in Koi Sheheri Babu from Loafer. IMAGE: One can never tire if the Asha-Helen combo... It will always be Yeh Mera Dil Pyaar Ka Deewana for these two. 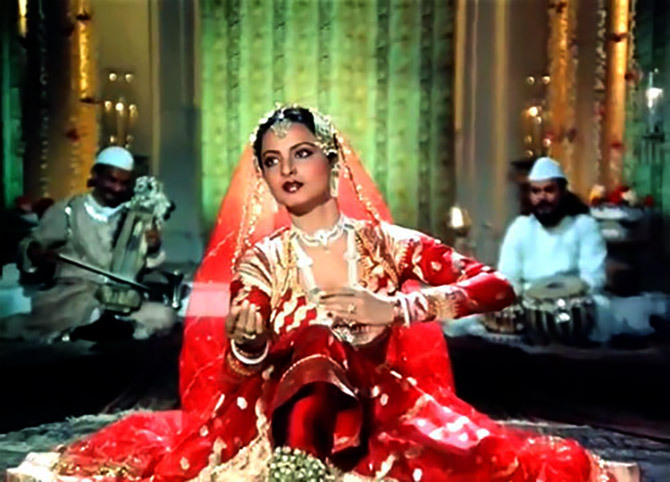 IMAGE: Asha offers her heart and Rekha accepts it with grace in Umrao Jaan's Dil Cheez Kya Hai. 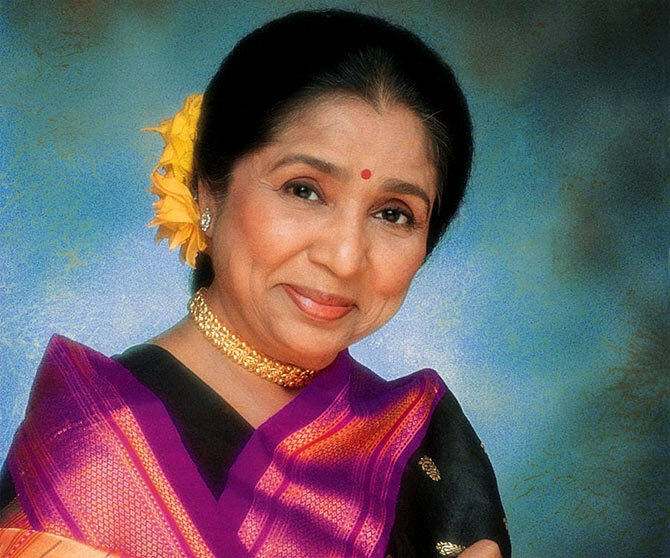 IMAGE: Dimple does full justice to Asha's sultriness in Jaa Ne Do Naa from Sagar. IMAGE: Urmila may have needed a makeover in Rangeela, Asha didn't. And Tanha, Tanha proves it. IMAGE: Kalpana just won't listen to Dev Anand's appeals in Teen Deviyan's Arre Yaar Meri... once you hear Asha, you'll know why.